Be the first to share your favorite memory, photo or story of Sylvia Montana. This memorial page is dedicated for family, friends and future generations to celebrate the life of their loved one. 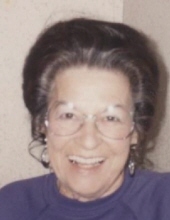 Sylvia Montana Negu McKee, 90, went to be with her Lord and Savior January 28, 2019. She grew up and lived most of her life in the Kevin Oilmont area. She spent her later years in Great Falls. Sylvia married Raymond McKee in 1953. She read her Bible every day and was an amazing cook. She was always the life of the party with her one-liners and infectious smile, and a laugh that filled the whole room. She enjoyed crocheting, oil painting and going south in the winter. Sylvia is survived by her 3 children, Larry Moulton, Lana Keough and Allen McKee; several grandchildren; great-grandchildren; sister Iva Peterson. There will be no funeral services per Sylvia’s request. To plant a tree in memory of Sylvia Montana Negu McKee, please visit our Tribute Store. "Email Address" would like to share the life celebration of Sylvia Montana Negu McKee. Click on the "link" to go to share a favorite memory or leave a condolence message for the family.